SAYING goodbye is never an easy thing to do, especially when you know that it's for good. Last Saturday (January 9) as my family and I laid our Grandma to rest, fellow mourners were preparing to do the same for fallen soldiers Zachery McCormick and George Miok, both based out of Edmonton. Grandma T, as we used to call her growing up, was born Martha Mary Juliette Goubault on March 15, 1920 in Edmonton. She grew up in nearby Tofield, about 70km southeast of the city, where she eventually married Emil Karl Tiedemann, on New Year's Eve 1938. Emil was a farmer and a carpenter who played the banjo, guitar and fiddle in the family band, and even made trips to Edmonton to perform on special occasions. In December 1970 Martha was widowed, left alone with their four grown children Yvonne, Bobby, Lucille and Mary. Years later she met Robert ("Bob") Hyde, a World War II vet, and they remained companions until his death in November 1997. Grandma was 89-years-old when she died in Camrose, on December 28, 2009. Grandma loved Edmonton and frequently visited the city with Bob or her children, dining at our restaurants & cafès, strolling through the river valley, and whole-heartedly cheering on her beloved Oilers. Whenever we visited Grandma & Bob in Tofield I remember noticing Oilers memorabilia strewn across the room, and there always seemed to be an Oilers game on their TV set. Some of those Oilers momentos made it into her endless stack of scrap books, as did countless newspaper clippings telling of Edmonton's triumphs and headline happenings, and images from her numerous trips to the city. Some of the other keepsakes she stored in the pages of these detailed scrapbooks were memories of our nation's militants. In fact, if Grandma was still here today, one of the last clippings glued or Scotch-taped to the cardboard sheets of her scrapbooks may very well have been stories of the recently killed Edmonton soldiers. Sgt. George Miok, 38, and Cpl. 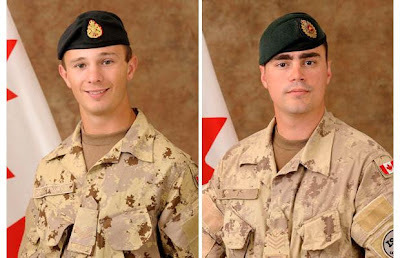 Zachery McCormick, 21, were both based out of Edmonton, and both were killed by an improvised explosive device in Afghanistan on Wednesday, December 30, 2009, just two days after Grandma passed. The blast also claimed Sgt. Kirk Taylor, 28 (of Yarmouth, Nova Scotia), Pte. Garrett Chidley, 21 (of Cambridge, Ontario), and Calgary Herald journalist Michelle Lang, 34. When I went to read my Grandma's obituary in the Edmonton Journal the next day, on New Year's Eve, the headlines read "Blast kills four soldiers [and] Calgary reporter." It was on the same Wednesday that the soldiers were killed that I found out about their deaths. My boss had my co-workers and I assemble in one of the open spaces of the building, where he disconsertedly announced that the war in the Middle East had just claimed four more soldiers. One of those soldiers was Zachery McCormick (far left). I had never met or even heard of the young corporal, but my boss informed us that he had once worked here, a few years back, and that his father Robin is one of our current co-workers. I was not well-acquainted with Robin, not even sure if I was picturing the right face in my head, but this was the closest I'd come to the sad repercussions of this long, brutal war. In the coming days I learned that Grandma's memorial service would take place on Saturday, January 9th at 1:00 in the afternoon. It would be held at the Glenwood Memorial Gardens & Funeral Home in Sherwood Park, and was for immediate family only, as were Grandma's wishes. She didn't want to "inconvenience" even us in her death, so prepared for a simple service in which her ashes would rest in peace alongside Bob's. When I returned to work after the New Year's break I noticed an announcement posted on one of the entrances, inviting all staff to attend Zachery's funeral ceremonies. It was scheduled for Saturday, January 9th, at Glenwood. At first I didn't think anything of it, not yet realizing that my Grandma's memorial was on the same day and at the same facility as the funeral service of Zachery McCormick. That is until a few days later, when my parents informed me that the time of Grandma's service was "bumped up" to allow McCormack's service to take place at a more accessible 1:00 instead. Initially I was upset with the insensible gesture, hearing that the funeral home had told--not asked--my family that Grandma's memorial would be held three hours earlier, with barely any notification. But then I remembered how Grandma was, her selfless attitude, her generous character, and I knew that she wouldn't bat an eye at Glendwood's decision. 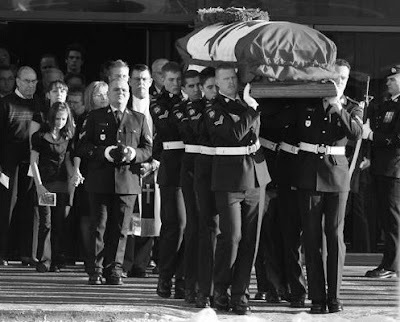 She'd most likely oblige to their request, and gracefully relinquish her scheduled goodbyes for anyone who served our country, as her partner Bob had. This was just her way. "I'd like the memory of me to be a happy one," Grandma wrote before her death. "I'd like to leave an afterglow of smiles when life is done. I'd like to leave an echo whispering softly down the ways, of happy times and laughing times, and bright and sunny days. I'd like the tears of those who grieve to dry before the sun, of happy memories that I leave when life is done." After the services the family converged at my aunt & uncle's home, back in Edmonton, where we remembered things we hoped never to forget, over tea and chocolate. It was by that time that hundreds of family members, friends, and even strangers said their final goodbyes to Mr. McCormack, who had the honour of lying in that same "field of honour" as my sweet Grandma. But it is Grandma, I know, who would feel honoured in resting in the company of heroes. And as for "bumping up" her services to accommadate the soldiers' families, she wouldn't have it any other way. Rest in peace Zachery, George, and Grandma. In July 2009 my parents, sister and I visited my Grandma at the Tofield senior's home she'd been living in for over a decade. The photo at the top of this article was the last one I took of Grandma, as she browsed through one of her scrapbooks. That same afternoon we all went out for something to eat, and before we left Grandma gave me something other than that final photo. It was an ammunition box that soldiers used during WWII, and it currently sits on display in my livingroom. I think back and realize the subtle correlation between that gift and her final resting place, next to our fallen soldiers, and amongst the ashes of her companion Bob, who fought in that very war.